Will Smith, then No. 91 of the New Orleans Saints, stretching at the Saints training facility May 24, 2012, in Metairie, La. New Orleanians are planning to celebrate former NFL player Will Smith's life with style, holding a second line, a brass band parade, in the slain player's memory. The second line will take place Wednesday at 6 p.m. and will be led by musician James Andrews, WWL-TV reports. The New Orleans Saints is also planning its own memorial celebration at the team's practice facility in Metairie, La., on Friday, which will be open to the public, the news station notes. Smith was team captain on the Saints' Super Bowl team in 2009 and played every single one of his 139 games in the NFL with New Orleans, the station reports. Smith's death came as a shock after he was shot and killed late Saturday night in what authorities say was a road rage incident. 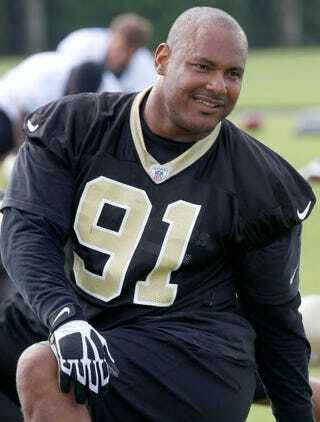 New Orleans is scheduled to induct Smith into the Saints Hall of Fame this year. The former NFL player had planned to be a coaching intern on Sean Payton‘s staff in 2016.